At Digital Firefly Marketing, we like to stay on top of trends. 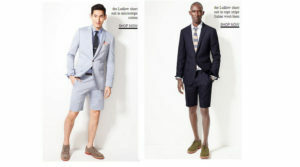 Trends can be worthless — remember when they told us the short suit was going to take off for men? — so we don’t recommend jumping on every single trend that is predicted. What we do here, and suggest to our readers, is watching for trends that catch on, learning about them and then implementing them into your digital marketing strategy. Here’s our trend round up for PPC in the first half of 2018 and what we think is deserving of your attention. We don’t mean that ads will include the user’s name, although how that hasn’t happened yet is surprising – it’s how marketers get us to click on spam, after all. But personalization in PPC is far smarter. And considering that businesses using personalization are seeing an average 19% increase in sales (Econsultancy), this is definitely one to get on. So, what is it? It uses demographic data and more to target who sees your ads. Life Events included in popular platforms, for example, will trigger what ads are shown. If you sell hiking gear for dogs, people who include online that they adopted a dog or look for hiking trails related to dogs will see your ads. As Amazon becomes an even hotter place to sell and continues to up its PPC game, more and more businesses will optimize PPC ads there. Amazon uses a similar mechanic to AdWords including the importance of keywords. Amazon pay per click differs from Adwords when setting up ad campaigns – so it’s important to learn the difference! PPC trends articles used to focus only on Google. But just like Amazon is becoming a formidable player, Facebook and LinkedIn are upping their games. Andrew Goodman, of Zero Page Media, went so far as to suggest increasing ad spend budgets on the two platforms by at least 100% and up to 200%. Every year we hear that voice search is going to completely change search, but we’re still not sure this is going to happen. Maybe people still use the same phrases when searching with voice as they do when typing. We don’t know. What we do know is there hasn’t been any revelation to make us think this should be prioritized over the pay per click trends listed above. Digital Firefly Marketing has expert pay per click marketers who are ready to optimize your campaigns to boost sales. Get in touch today for a free ppc audit to see how your strategy and ads stack up.